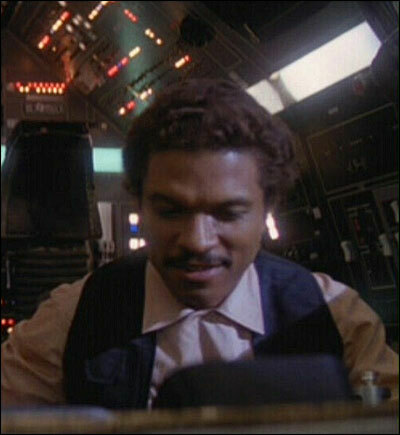 Coilhouse » Blog Archive » Where Have You Gone, Lando Calrissian? Where Have You Gone, Lando Calrissian? EDITOR’S NOTE: Here’s another insightfully inciting essay from Jeffrey Wengrofsky, who is currently co-starring as Chief Medical Examiner of the City of New York City in Speakeasy Dollhouse, a real life, vice-filled murder mystery set in a former speakeasy on the Lower East Side of Manhattan. Directed by Cynthia von Buhler, the production’s cast has also included Edgar Oliver, Kate Black, Edgar Stephen SNAFU, Katrina Galore, Amanda Palmer, Neil Gaiman, Katelan Foisy, Dana McDonald, Ali Luminescent, Heather Bunch, Porcelain Dalya, Russell Farhang, Amber Baldet, (Silent) James Lake, Rachel Boyadjis, Justin and Travis Moore, Syrie Moskowitz, Maria Rusolo, and Josh Weinstein, to name a few. Everyone we know in NYC’s been going gaga for this production, so please check it out and report back! New York as Cloud City. Photo by Heather Allen. After DJing at the Coilhouse Black & White & Red All Over Ball last August, I came down hard and fast. As a resident of lower Manhattan, I winced at the oncoming anniversary of 9-11 and braced for the immediate impact of Hurricane Irene. Media experts speculated that my neighborhood, barely three feet above sea level, would soon be under the swelling East River, and I imagined New York City’s primordial industrial artery oozing green across my lobby like that scene in The Shining when the blood comes out of the elevator. After a trip to the local store for batteries, canned goods, and bottled water, I got on my elevator with a veteran of Burning Man who shared information about high tides, planetary formations, and the Mayan calendar, bringing together science, new age pontificating, and classic Lower East Side pessimism to pronounce absolute DOOM on the city, the United States, Western civilization, and the world as we know it. In the least it seemed certain that my building, only a block from the river, would join New Orleans, Indonesia, and Bangladesh as places where people waited atop roofs for relocation by helicopter. My dear friend and fellow Coilhouse contributor Angel Polacheck, herself an evacuee from New Orleans, appealed to her personal experience of relocation and invited me to travel with her to Pittsburgh, but after weighing my fears and imminent responsibilities (my fall semester teaching responsibilities beckoned from the coming week), I resolved to go down with the city. Having been born only a few blocks from where I now live, I imagined myself reclaimed by this land, neck deep in slimy muck with the likes of Jimmy Hoffa and the wrecks of old sailing ships on the gooey bottom of the East River. Hatches were battened in defiance. My computer was fastened to the National Weather Service for constant updates. Rain fell hard against my windows. Waters swirled and rose. As I drew a bath for future use, I stared at the water – my nemesis. What could be more innocent than water and who was I to defy it? Conscienceless, unconscious nature seemed poised to dish out death with the blank remorselessness of the bear in Grizzly Man. I compiled plaintive dispatches from the new Atlantis and contemplated the worst. Damn the clichés: will rising tides sink all ships? As it turned out, Irene did not tuck New York into its riverbed with a long “goodnight.” Instead, she spat her guts out all over New England and upstate New York, flooding several towns and small cities. New York City incurred minimal damage, but the hours of anxiously awaiting my fate left an impression on me. Shortly thereafter, my building, like much of the Northeast, undulated during an earthquake possibly attributable to natural gas fracking in Virginia. In the past ten years, a sense of looming cataclysm—whether from ecological disaster, nuclear conflagration, terrorism, martial law, biological contagion, or economic implosion—has settled on people I know, forming a sad, silent backdrop to our lives. We are resigned to our coming undoing, but we do not yet know what form it will take; so we grin and grind and grunt toward a collective future that none of us will have consciously chosen. While one of the conversion points of the left and right of the political spectrum may come at the oft-professed fashionable desire to see New York City destroyed, such an event would drown the entire global economy, which would be more than a merely “inconvenient truth.” Besides, rising sea levels will inundate every coastal city and small town in the world and the millions of soggy, displaced persons washing up on every door will make a mess not easily absorbed by any society or economy. And if, somehow, you are still savoring some schadenfreude, then contemplating the water shortages, heatwaves, tornadoes, earthquakes, or forest fires soon to be visiting the hinterland should stir the embers of empathy in your Grinchly heart. To paraphrase Joe Strummer: New York is sinking and we all live by the East River. Brushing this dismal sensibility against its grain has, however, led me to wonder who has a viable plan—the roadmap to the Cloud City of Lando Calrissian, as depicted in Star Wars, perched safely above the tidal torrent—that can take New York City across time to the centenary of 9-11 or thereabout. In contrast to Star Wars, the film Waterworld confronts its viewer with a world in which civility, culture, and cosmopolitanism – the urbanity of urban life – rot on the ocean floor. Will technology carry our species above nature or is our irresponsible use of technology only the first part of a Faustian bargain that will soon collect its debt with a tidal interest? With the vast scientific, cultural, and economic capital invested in New York City and a population in excess of eight million souls, New York is truly WAY too big to fail—so how must it be transformed if it is to survive? To think about the next hundred years, let’s briefly consider what the last hundred has meant for New York City. A hundred years, about the average life expectancy of the Coilhouse reader, is a thin slice of geological time and nary a wink for the cosmos, but an eon for technology and a long stretch for anything related to the United States. Although a city on this site can be dated to 1624, its most recognizable contemporary features—skyscrapers, subways, sewers, multiculturalism, and telephone networks—were only really coming on line about a hundred years back. As technological change builds and nature’s necessities impose, what profound changes are over the horizon? 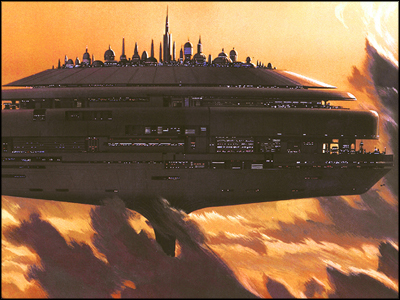 Will the Staten Island Ferry run to Cloud City? A few weeks after Irene passed over, I happened upon my State Senator on the subway and dove right in: “Being that the City is reconstructing its waterfront promenades, why aren’t they built with dykes able to withstand rising sea levels?” His reply: “That’s a very good question. We build large public works with a 50-year period of capital depreciation. According to the scientists, global warming won’t be affecting us in New York City for another 50 years or more.” A politician who’d been caught in my headlights, he then politely scampered off the train after traveling for only one stop. With the belief that Irene offers a lesson that now is the time to begin creating infrastructure that can sustain the rough tides of an unfriendly future – a future that was narrowly averted as recently as August – I took my question to the Deputy Mayor of New York City. His assistant summarily ushered my attention to a report by the New York State Department of Environmental Conservation—an organization that cuts a low public profile. 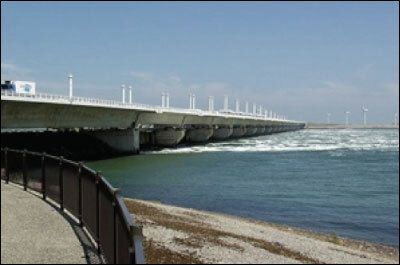 This document posits rising sea levels of 12 to 55 inches by the end of this century (p. 11) impacting the entire New York State coastline from “Montauk Point … to the federal dam at Troy” (p. 9), requiring sea walls and dykes as well as the elevation of some buildings when “non-structural” solutions will be insufficient.2 I noticed that, while the City participated in the preparation of this report, it did not commit to five of its fourteen recommendations, most critically that which would have “requir[ed] state agencies responsible for the management and regulation of resources, infrastructure, and populations at risk from sea level rise to factor the current and anticipated impacts into all relevant aspects of decision making” (p. 10). As a living organism of sorts, I would not expect a municipality to cede “home rule,” but the scale of any possible solutions will likely require regulation and coordination at the highest levels of government. Is there a government in the known universe that is worthy of such a project? A bureaucrat dreams up an overpass and dubs it the road to El Dorado. 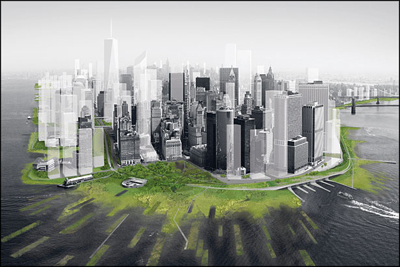 While I applaud the sense that we need to work with nature, it seems unlikely that this approach will be enough to save New York City’s 570 miles of coastline—more than any other American city—and all of that cultural and financial capital in the short while before the next flood. 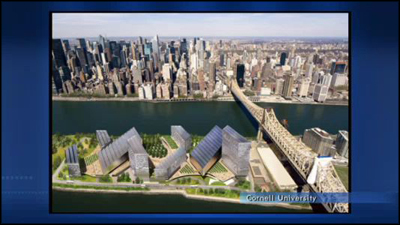 Perhaps the new Cornell-Technion and NYU-Poly campuses will be immediately tasked with this challenge, since it will confront them directly on Roosevelt Island and in downtown Brooklyn, respectively. I do not know if their buildings are being designed to account for climate change. Will the Cornell-Teknion campus get water wings? For nearly 2,400 years the story of Atlantis has been the archetypal tale of urban cataclysm. The earliest known account of Atlantis comes to us from Plato, a philosopher, not Herodotus or Thucydides, two of the best known ancient historians. This distinction is important, because Plato’s dialogues aimed toward a sort of wisdom beyond mere appearances and the presentation of assorted facts. A case in point, the cave Plato refers to in the Republic is obviously an allegory—but it is, actually, an allegory about how allegories may better communicate Truth than our attempts at literal representation. Thus, his tale of a city-state on a continent “larger than Libya and Asia together,” which “in the course of a single, terrible day and night … sank beneath the sea and vanished”4 in the Atlantic lacks archeological or oceanographic evidence or even folkloric corroboration. Even Aristotle, Plato’s most revered pupil, himself a dedicated investigator of comparative civilizations, thought it apocryphal and unworthy of study. Yet the story lives on in countless films and books that try to discover its facticity, and it is ever-active in the imaginings of artists. Perhaps this tale of a maritime city whose rise to prominence brings it into a nasty brush with another empire (that of a primeval Athens somehow existing 9,000 years before Plato) before being flushed into oblivion has an enduring allegorical applicability. Or perhaps any story, repeated often enough, takes on a life of its own, and defining the line between fact and fantasy is less interesting than why it is that we want to believe it in the first place. Does the story of Atlantis endure because it meets with a desire hidden away in the deep, dark depths of our psyche to witness—if not endure—our own destruction? A delightful article about the sort of things things that plague my mind each night before bedtime. I’m glad I live inland, on higher ground. Maybe by the time my property is at risk, someone will have figured something out. An excellent, well-thought-out and well-researched commentary… and one that reminds me of why I chose to buy an apartment in a low-rise building within a short walking distance of (and not too far vertically from) the highest natural point on Manhattan Island. Clearly it wasn’t just in a financial sense that the lower costs of real estate in Washington Heights (or Hudson Heights, as the realtors in the area are calling my sub-section of WaHi) will assure that I can keep my head above water. perhaps the answer is to only live and work on bedrock. a significant percentage of manhattan is built on landfill and stands a good chance of having the earth beneath its feet all but disappear as the buildings sink forever into the dust. within moments of this happening the rivers and the bay will rush in to reclaim what was once theirs. 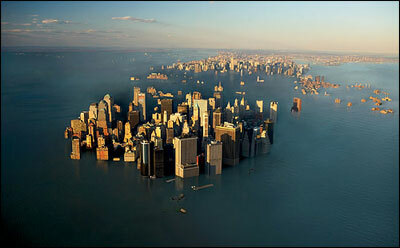 as fast the towers went down, much of this city will become a second atlantis. sadly, it will take with it most artists, best bars, and the east side hospital network. pre-merging with the slowly rising waters seems a good idea. excellent write up jeff. Having just finishing a five hour tubing ride down the Huron River yesterday I’m really in touch with the power of water (and rocks after hitting everyone in the river) and could’nt help but wonder how the Native Americans surivived these natural events. Once again Mr. Wengrofsky brings me to the point of introspection with him writing. I have to think that like our forbearers (Native American that is) we’d have to continue Onward through the Fog. Awesome ,well thought out, and written. Always a fan of Jeffrey’s articles. Excellent article. I went through Katrina too and this stuff is still pretty hard for me to think about. The author’s focus on policies to accomodate global warming is apt given that the percentage of U.S. voters who believe that global warming is a real and serious problem is declining (to about 57%, down from around 70% ten years ago), even as the scientific support for global warming nears consensus. Growing up in South Florida, we were taught a healthy respect of cataclysmic weather events. After Hurricane Andrew, building codes were improved and when the next big storm came, we could see that the damage was lessened due to our preventative actions. Now living on the LES, I am still not used to thinking about weather and climate in generational terms. Global warming DANGER sure, but planning public works projects to take into account mitigations that won’t be proven successful for at least another 50 years? It’s easy to see why city government pushes off long term planning for short terms results. It’s not right, but it’s easy. When I got to the end of the essay, all I could think of was why can’t we pull policies together to anticipate what Wengrofsky reasons so well? Who me? Yeah. I’m worried. Well written, well-reasoned, thankfully a little humor, and more importantly, warning. i’ve been having this dream for years. i’ve seen the storms blow up onto the shore. i’ve dreamed of the inundation. the ailanthus trees taking over. the sinking city … i cant wait. i have a canoe. we can fish. I found this to be Wonderful- Informative , Comprehensive WITTY in the extreme ironic and the subject to be fascinating yet Troubling…Wengrofsky warns of a future that bodes ominous … I think we should take heed- WE HAVE BEEN TOLD..
Great article, Jeff! It truly makes me feel better about having so much anxiety during Hurricane Irene. I was living in a basement apartment near the Hudson and I was terrified I wouldn’t have a home to come back to after Irene had made her way through the city. All the while, my roommate laughed at me and thought I was nuts. Great article, well-written and informative. Humerous as well. Another thorough and captivating article by Wengrofsky. Thank you so much for writing on this critically important issue. I live in another coastal city, less in danger, but I dream of moving to New York, and that sense of looming cataclysm so many New Yorkers share is precisely what keeps me from making the move. Please let’s get past economic and political blocks, and brainstorm a solution! Excellent, palpable piece on the future, and on what is leading us all up to our respective end, the unknown, the post-apocalyptic big picture or whatever we call it. Reading this was article was engaging, humorous, frighting and relieving. “tick-tock, times running out but I’m just gonna go on with my day, maybe the nuclear plant will explode, nothing shocking”. It seems I’m not alone in having that feeling of capitulating and/or being resigned to a certain doom that is always looming but never clearly understood. This is article has deep roots on so many levels. Such a daring subject to put out there and put your name on. More articles pleeease Jeffrey Wengrofsky! I would suggest that Lando is in the clouds of Beijing re-educating a docile nature to attack the one that harms it. Another excellent article from the always entertaining and provocative Mr. Wengrofsky. Absent a Calrissian, the Rapture may not be nearly as fun as advertised. Though it’s worth considering what you and Mr. Hoffa might find to talk about, at bottom. Jeffery Wengrofsky has yet again put together an amazing piece for Coilhouse. This installation is about our future. In Mr. Wengrofsky own words “this article is really about the bleak future facing us all. SF will soon be buried in an earthquake, LA will burn and run out of water, the Midwest has tornadoes, the southwest has no water – there is no place to run to.” The US is headed for another great depression? How will be cope? In my estimation Coilhouse IS coping. It’s coping by artistically commenting on what is happening around us. Continuing to create events, happenings and discussion. Wish I were in NYC to attend the Coilhouse Black & White & Red all over ball. Wengrofsky follows a flood of informed, well read, hyper aware and curious thoughts from rising sea levels to complete urban cataclysm. Read this article and others from Coilhouse. Jeffrey Wengrofsky and Coilhouse indeed informs, inspires and infects! What is not mentioned in this article quite some time ago the speedway promised to build a 20 foot high wall along the side of the strip to buffer the noise but has failed to do so. For that reason the judge shut it down and worse yet, an entire new EPA impact study may have to be done before it can reopen. I’m haunted by Wengrofsky’s “Where Have You Gone, Lando Calrissian?” Disconcertingly prescient, the article is an engagingly creepy ride—with beautifully ominous pictures I’d like to forget—through political, scientific, artistic, and mythic spookhouses whose disquieting designs offer no calm about global warming and rising water’s threats to Manhattan. Written with September, 2011’s Hurricane Irene as its focus, Wengrofsky’s article poetically notes that “As it turned out, Irene did not tuck New York into its riverbed with a long ‘goodnight’”; however, the city’s recent Hurricane Sandy did exactly that, not just with the East River, but with the Hudson even more. What is hypothesized in Wengrofsky’s article as a “sense of looming cataclysm” was actualized by Sandy’s night-night punishments to Manhattan, which still sting and throb. Clearly, Wengrofsky had a point to make. And with astute reporting of the do-nothingness advocated by his State Senator, the New York State Department of Environmental Conservation, and MOMA’s essentially aesthetic Rising Currents project, Wengrofsky floods us with political bureaucracy’s turgid muddiness and hypothetical art’s watery currents. Yet despite its severe content, the article’s tone can be humorous (“Underwhelmed, though not [yet?] underwater”), its writing rich with meaningful allusions to film and music. What could have been a didactic, moralizing essay that had no guts, no felt dread, instead is an artful acknowledgement of the eerie ecological ghosts with which this heavenly island must deal. Between 2006 and 2012, as my Coilhouse article details, I spoke with my NY State Senator and communicated with the NYC Deputy Mayor’s office on the issue. I also read every report on NYC’s infrastructural preparedness that I could find. I’d planned on directly asking Deputy Mayor Holloway a question about it at a forum held at Baruch College on February 23, 2012, but the moderator declined to call on me, probably for fear that I’d ask such an impertinent question. A pity ! While the topic – NYC’s demise and the bleakness of our collective future (regardless of geography) – horrifies me, I am nevertheless glad that I was able to publish my article BEFORE Hurricane Sandy came crashing into town. Since then, however, no elected representative has been asked to account for our lack of preparedness and no large-scale projects to save the City (or the planet) have been put into action or even presented before the public. That, too, is a pity! What is beyond pity? Shame, perhaps. Thanks to everyone who chimed in. And thank you, Coilhouse, for allowing me to play the role of Cassandra. Where’s my wig? Great approach. Everyone should re-read this after Hurricane Sandy. I hope your place was okay, if you were still there at the time. This is a thoughtful, far-reaching analysis of the kind of fears that come when we pay some attention to the fact that we’re not masters of our destiny, that we are circling around a star in space and at the mercy of rocks, ice, and gas. Thanks for grounded, chronologically liberated musings!